Your new discovery will at least need some TLC to bring back its grand luster it had before it was ‘covered-up’, see our “3 easy steps to clean and maintain your parquet floor” for this. 9 times out of 10 that's all it needs really. Always check the whole floor if blocks are no longer firmly attached to the underfloor – you notice either some movement when walking on it or a hollow sound when you ‘knock-on-wood’. Even if your floor is obviously missing blocks – removed for adding central heating or other plumbing/building work – check the rest of the floor too. Because most original English parquet floors have small tongue and grooves to lock them together you need to handle the removing of loose/damaged blocks with care – you don’t want to loosen connecting blocks needlessly. Missing blocks can be sourced perhaps from another room which you do not plan to restore (or try any cupboards in or around the room – you’ll be amazed how often a parquet floor was installed in there too! ), or from reclamation yards. Before you set out to find replacements note the exact size of the existing blocks, there were plenty different types of wood blocks in Imperial measurements around when these floors were popular (1930 – 1970). Also make sure the reclaimed blocks you find are from the same source to prevent very different wood species or colours ending up in your restored floor. Old parquet floors normally were fixed down with Bitumen – black tar - an ‘adhesive’ no longer allowed to be used inside the house. Any residue of bitumen has to come off as best as possible. Not the nicest of jobs, but consider it a labour of love. Chiseling, scraping, sanding (will use up loads of paper! ), or dipping them in Odourless Kerosene (always be very careful with chemicals, wear gloves and face-protection!) will remove most of it. Placing the blocks in a freezer first will make it easier to chisel or scrape off – the Bitumen becomes very brittle. Make sure any Bitumen is also removed out of all grooves. The underfloor (concrete or sheet material) must also be cleared of old ridges of Bitumen and if possible thick remaining layers. Any residue of Bitumen will affect the bonding time of the modern adhesive you use to install the blocks back. Where normally it takes between 6 – 8 hours, the residue could increase this to 14 or even over 72 hours! You might discover your underfloor where blocks have been removed is rather uneven. Or the removing the Bitumen has damaged the concrete or sheet material. You can use acrylic levelling compound to level a concrete floor out as best as possible – 3mm maximum per coat. Always read the instructions carefully before you begin with this type of job! And even though it is non-water based, allow sufficient time for the compound to dry before you start installing the wood blocks back. For uneven sheet material you can try to level it out with a hand sander or nailing/stapling thin sheets of hardboard onto it – smooth side down! Have a good look at the existing pattern your parquet floor is laid in, you will get the best result when following this as precise as possible. Take your time, but don’t be too afraid when small gaps appear between the blocks. Gaps should be kept as small as possible – hence our advice to clean of the Bitumen from grooves – but will appear nonetheless. Nothing to worry about too much, most of them can be filled after wards, plus original and modern parquet floors will have tiny gaps too due to the seasonal changes in air humidity – making the blocks expand and shrink slightly, a very natural phenomenon. Us a notched trowel to spread a modern parquet adhesive on the underfloor, this will create ridges of adhesive onto which you firmly place the blocks. For small areas you can use the so-called trowel-knife (only 8cm wide). The ridges will spread out under the block, giving it an even coverage. Small dips in the floor or block will be covered too this way – not when you spread out the adhesive in just a thin layer. But please remember: adhesive is not a filler for deep or large dips in the underfloor (see step 3). Keep a cloth at hand to wipe of any spillage of the adhesive from the surface of the blocks – once dried it is harder to clean it off. If needed – especially when you sourced reclaimed blocks – cut the blocks to the right size with a jigsaw and install them into the pattern. It might be necessary to remove the tongue of some blocks but that’s not a problem – the modern adhesive you use will keep the blocks in place. For the best result and a very uniform finish on the whole floor it is best to sand the whole area, not just the re-installed blocks. Remember – the more Bitumen was left on the blocks and/or underfloor the longer it will take for the blocks to bond firmly and the longer you’ll have to wait before you can start sanding. You don’t want the blocks to start moving around and creating wide gaps! Depending on the old finish layer of the original parquet floor you might have to clean off that layer first before you start sanding – layers of wax will clog-up your sanding paper very fast, making it useless and could spread the wax all over the place! If this is the case you first have to remove the old wax with special Wax Remover or White Spirit – try this out in a corner. Make sure there is enough ventilation in the room when applying any of these products. Start with vacuum-cleaning the floor. Use a belt-sander for this part of the job, the endless sanding paper won’t leave scatter marks on your wood floor like a drum-sander can (because of the metal rod that has to keep the sheet of sanding paper fixed to the drum). An so-called smaller edge-sander will help you sand edges and the corners of the room where the large sander can’t reach. Most professional hire companies will have a combi-offer: belt-sander and edge-sander for a weekend at reduced prices. If you notice many height differences between the blocks, especially where old meets new – the reclaimed blocks – start with grit 40. It’s advised to sand with the grain, but herringbones and various other patterns could make this a bit problematic. Nothing to worry about, the various sanding rounds you will have to make will sort this. Start in one corner of the room and ‘walk’ the belt-sander across to the other wall, walk back sanding over the same area – with a belt-sander this is possible, a drum-sander might refuse to be walked back. At your starting wall start the next ‘row’ overlapping the first row half to prevent sharp edges where the sanding machine has done its work. After you’ve done the last row this way, turn 90 degrees and redo the whole room in the same way. Place grit 40 paper on the edge-sander and tackle the areas the belt-sander couldn't reach. Because the movement of the edge-sander is different (circular) than the belt-sander (straight) you could see little circular sanding marks on overlapping areas. Don’t try to sand them away with the edge sander – it will only become worse. Following sanding rounds will clear most of them anyway. Repeat the whole task now with grit 80. Before you start sanding, empty the sand-dust collecting bag, you’ll need the dust of grit 80 – clean dust – for mixing with the wood-filler later. The dust from the first sanding will contain dirt and residue of the old finish layer. After finishing round 2 vacuum-clean the whole floor. If you want to fill the gaps in your wood floor mix the collected sand dust from the second sanding round with the special wood-filler. Don’t make too much at once, it dries rather quickly. Fill the larger gaps with a scraper as best as possible, don’t worry about excess filler on the wood blocks, the third sanding round will remove it. If you want you can also ‘plaster’ the whole floor with a thin layer of filler, using a flat trowel, to fill almost every tiny gap. After you’re satisfied you’ve filled all gaps you wanted to fill leave the applied filler to dry out sufficiently, 30 to 60 minutes depending on how deep the gaps were. Then use sanding paper grit 120 for the third sanding round, this will remove the excess wood filler and give your wood floor the smoothest surface, ready to have a new finish applied to it. Follow the same pattern with the belt-sander as before and end with the edge-sander. Or - if you can get one - use a so-called Trio-sander for the last sanding round. It is a still rather new innovation and should only be used when working with a higher grit. Because of the circular movement and speed of the three disks underneath the machine you run the risk of 'being swept away' by the machine when using a rougher grit (like 40 or even 80). Most professional sander hire companies will have one and it will give you an even better result than using a belt-sander for the last sanding round. 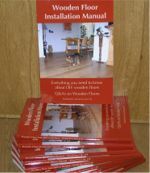 It will also be able to remove sanding marks from your wood floor, especially on the 'border' of belt-sander and edge-sander (not all, see also our leaflet "What not to expect"). When you use the Trio-sander use grit 100 instead of 120. The speed of the disks creates a very smooth surface on your wood floor, grit 100 then compares with the same finish grit 120 on the belt and edge sander will give you. Oils will show off your restored floor best, bringing out its natural character in a none-glossy way. The oil will penetrate the wood for long term protection and the wax will create your wear and tear layer, protecting your floor against dirt and drips. If you prefer a varnished or lacquered finish you’ll have to sand again with grit 150 to prepare the wood as best as possible for a varnish/lacquer finish. Always, always read the instructions of the product you’re going to use. See our chapter: "Which Oil to Use when" also, especially when your original floor has a tropical nature. You could notice some local patches appearing duller or shinier than the rest of the floor. This could mean the wood there has absorbed more or less oil than its neighbouring blocks. Don’t apply a third coat of HardWaxOil, but buff the area lightly. If this doesn't seem to help, wait a few days to see if it ‘evens-out’. If it still appears differently than the rest of your floor apply some power wax or wax-polish locally to feed it. 9 times out of 10 this will do the trick. You can place most furniture back in the room once the second coat has dried for 8 hours. Wait 10 days before you place rugs on top of your newly restored wood floor, HardWaxOil takes 10 days to cure completely. It will however protect your floor against dirt and drips immediately! You now have a beautifully restored, valuable and durable floor covering! Remember, a newly installed parquet floor would have set you back £ 125.00 - £ 145.00 per sq m. With these 7 easy steps you do this labour of love for a lot less! Take good care of it now (wooden floors have the extra benefit of easy-maintenance) and it will continue to reward you for many years to come for all the TLC you’ve spent on it.